CSS offers a range of ComView site management gateways to help you monitor, control, and manage your remote site infrastructure systems and site conditions more efficiently and effectively. Programmable Relay-Driven Outputs - automatically control and manage external devices according to user defined rules. Multi-functional Virtual Ports - network with site system IP ports for secure remote system administration, data collection and analysis, alarm monitoring, or system automation and control. The multi-application capability of ComView helps users lower overhead costs and improve operational efficiency in comparison to using disparate fixed function devices. 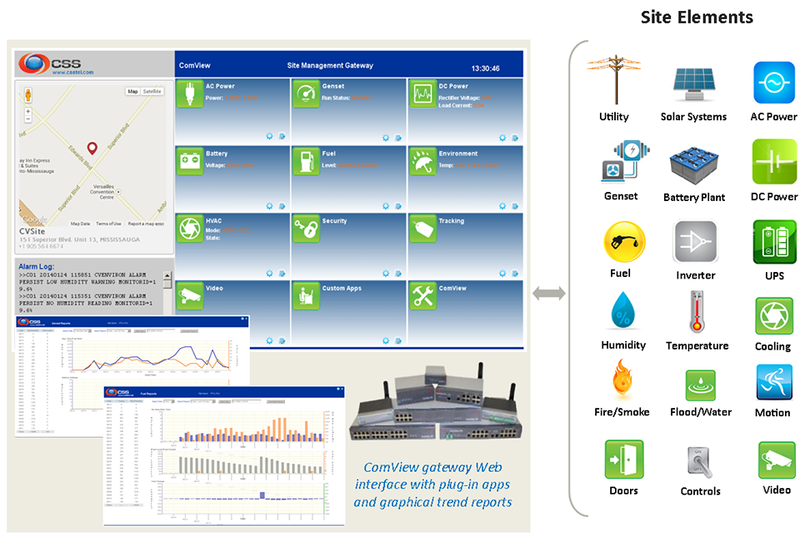 ComView can intelligently interpret alarm relay contacts, analog signals, and data streams (ASCII, Modbus registers, SNMP traps/OIDs) either passively received or interactively extracted through message exchange procedure and map them into SNMP, Modbus, BACnet, or formatted ASCII records suitable for integration with upstream NMS and application-specific processing. The site mediation capability of ComView helps users consolidate and simplify the tasks of remote site operations, maintenance, and management. ComView can proactively monitor any site systems and site conditions for user-definable alarm conditions with unique alarm handling capabilities. These include alarm qualification, classification, escalation, multi-location/multi-format notifications, and automated corrective actions. The advanced alarm monitoring capabilities of ComView help users resolve issues at site more quickly while reducing workload for NOC operators with alarm filtering and automated corrective actions. ComView helps users simplify site management by automating tasks that are performed regularly; such as periodic generator tests, backing up equipment configurations, and routine system administration. ComView lets users collect strategic data from site systems, perform data analysis, and if necessary automatically take corrective actions in real-time. Whether it’s for intelligent monitoring, management, or planning across the network; ComView helps make data collection an easy task. ComView can readily perform specific functions with plug-in apps in order to support specific site systems and user applications. Plug-in apps can range from simple tasks to more sophisticated applications that may involve protocol specific message exchange procedure and data processing to meet user specific requirements. With plug-in apps, users can greatly maximize the benefits from ComView.